When Maria Russo goes into hospital, her daughter, Gina, a newly graduated Harvard MBA, agrees to stand in for her at the Casa Rosa bordello, but she has no idea what she’s letting herself in for. Daniel Bouvier, cadet reporter with the Daily Monitor, also has no idea where his first stint at investigative journalism will lead after spotting his old friend unexpectedly leaving Casa Rosa. Soon both are caught up in a David and Goliath struggle, as Gina battles a powerful and ruthless media magnate in a bid to stave off bankruptcy. While casting a dispassionate eye over the contentious business of prostitution, this story is about the media's misuse of power and a daughter's need to earn both her mother and her staff's respect. I had no idea what I was getting with this novel, but it was really interesting and well done. Gretton describes the world of the brothel in a way that's adult without being in any way sniggery or smutty. The background feels well-researched, and it helps that the main character is an outsider looking in, so her view effectively mirrors our own. What surprises her, surprises us. But her pragmatic approach to running a business based on prostitution sets the cool tone of the story, and keeps the narrative from becoming sensational or sentimental. I think the subject is terrifically well handled - frank without ever being offensive - and I feel I learned a lot about a subject I previously knew very little of. And I do love a book which does that! 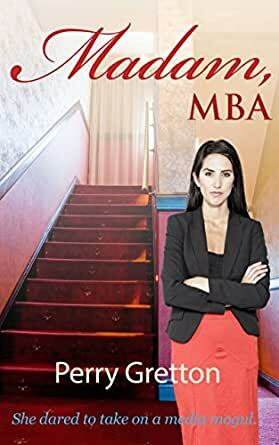 As the blurb notes, Gina Russo has just graduated with an MBA when, instead of interviewing for the high-flying job she believes she deserves, she’s landed with temporarily managing her mother’s bordello. I think we can all sympathise with Gina, who wants to keep this interim arrangement low key, in the hope of not tainting her other opportunities. Perry Gretton has written an eminently readable novel in which I was able to sympathise with Gina, who has just moved out of academia into the rough and tumble of the real world, a world in which hookers somehow seem more honest than journalists, and relationships are earned rather than handed out on a plate. That said, the focus is very much on the characters and the challenges they face, rather than being an expose of the steamier side of life. Really enjoyed this read, hadn't previously given much thought to the industry, and it was interesting to see the business end being the forefront of the story.